Winner of the 2014 Top Homeschooling Curriculum & 2015 Parents' Choice Gold Awards! Platform: PC/Mac Kids Learn to Code in Java by Making Mods for Minecraft Youth Digital's mission is to teach kids real software coding and designskills by creating awesome projects with cutting-edge technology. In our most popular online course, kids will learn the fundamentals of Javaprogramming by creating their own Minecraft Mod for the PC / Mac version ofMinecraft. For every item, block or creature they want to add, kids will firstdesign and then code their object in Java. At the end of the course, they willhave their own completed Minecraft Mod that they created from scratch. 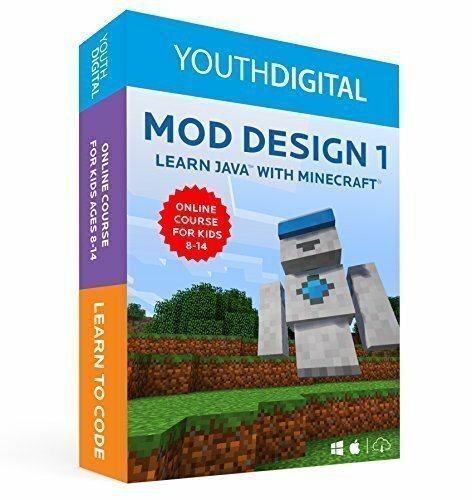 Mod Design 1 for Minecraft is a unique opportunity for young students to learnJava in an exciting way. They will not only come away with an impressiveproject to share with their friends, but also with a foundational knowledge ofobject-oriented programming. Software Overview In order to get started Modding, students first download and install Eclipse(a professional programming tool), and Java version 1.7. We install a staticversion of Java so that if Java updates, it will not disrupt the coursetechnology and user experience. Additionally, we use Minecraft version 1.6.4 to teach students how to createtheir own mod. We use this version instead of the most recent 1.8 versionbecause more recent updates would not be as stable or consistent for ourstudents long-term. While we teach our students program using the code basefor Minecraft 1.6.4, they can export their project to the latest 1.8 versionat the end of the course. Requirements: -Minecraft for PC/Mac -Windows 10, 8, 7, or XP or Mac OS 10.7 or higher -Macs MUST be 64-bit (after 2008) -Internet connection with download speeds of > 1 Mbps Includes a box, so it makes a great gift!